Josh Warrington upset the odds again to retain his IBF featherweight title with a unanimous decision win over Carl Frampton. Warrington was making the first defence of the title he took from Lee Selby in the summer and was the bookmakers' underdog at the Manchester Arena on Saturday night. 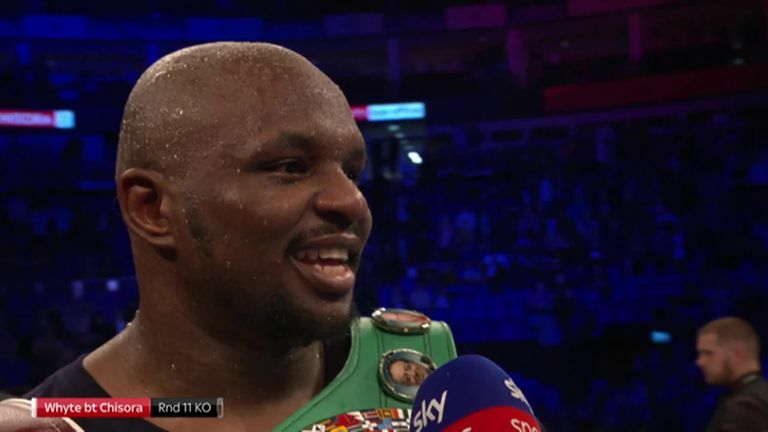 Dillian Whyte had heated words with Anthony Joshua after his spectacular knockout win over Derek Chisora in the eleventh round. The Leeds Warrior's familiar pace and output caused two-weight world champion Frampton problems all night, eventually securing him a 116-112, 116-112, 116-113 unanimous decision. It took Warrington to 28-0-KO6 and although he is not known for his power, an early hook troubled The Jackal who had to soak up even more pressure as the champion upped his pace. Frampton suffered a small cut from the onslaught but then calmed the pace and showed his experience and class, controlling the range and showing off the skills that had seen him reign at 122 and 126lbs. But spurred on by the Leeds fans, Warrington kept pressing forward, catching his foe on the inside and pinning him on the ropes in what turned out to be a non-stop affair. Frampton tried to keep him away but the champion kept coming, both swapping big shots as the title clash entered the championship rounds. It was then that Warrington stepped it up again, putting combinations together and in the closing stages, firing one-two's to nullify whatever Frampton tried. There was more disappointment for four-time world title challenger Martin Murray who lost a close points decision to one-time world middleweight champion Hassan N'Dam N'Jikam. Billy Joe Saunders won in his first bout since vacating the WBO middleweight title, with late replacement Charles Adamu retiring on his stool at the halfway point of a scheduled eight-round contest. Tommy Fury, the younger brother Tyson, made a winning start to his professional career with a four-round shut-out of Latvian Jevgenijs Andrejevs.